Beware, next time if you bring your children to the swimming pool, make sure they wear slippers except when they are in the pool. My poor boy stepped on a piece of glass near the pool. Fortunately I saw it when he pulled it out and throw it on the ground. I saw his foot was bleeding. Daddy took some tissue from me and applied pressure on it. We sat him down on the bench, still with the pressure applied on it. The pressure is to stop the wound from bleeding. Blood was dripping on the floor, I believed the cut was deep but small. Daddy wrapped a towel over his foot. I quickly dressed Emily up, dried Tim up and put his shirt on, so that he doesn’t get a chill. After a short while, I took off the towel and tissue soaking with blood. The wound stop bleeding and I put a plaster on. Yes I carried plaster with me in my wallet. At home, I bathed him. He sat on a stool with his wounded foot on another stool. I clean his wound a little and dried it. Then I applied yellow iodine onto the wound and wrapped it up with plaster. Some plaster would not stick. Daddy had to put cotton and wrap it with the white tape. He was limping but throughout the incident, he didn’t shed a tear. Today the wound heal nicely. 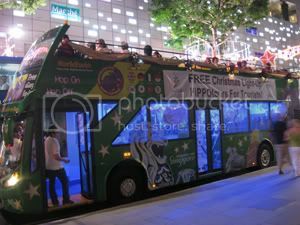 With the Hippo Tours, it has 2 routes on the Hop On Hop Off double decker bus. 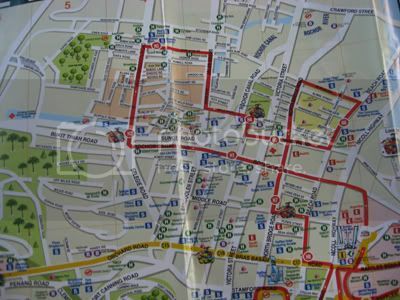 The city sightseeing and the heritage route. You can go as many times as you want. It takes 1 hour per route. The top of the bus is the open deck. The sun was scorching hot but yet there are people on the top deck. It will be bbq up there. We took the lower air condition deck to avoid being burnt. When the sun was not that hot, we went to the top to get a breeze. I took this tour because it is suitable for my children. They don’t have to walk much, they just sit in the bus and admire the journey. 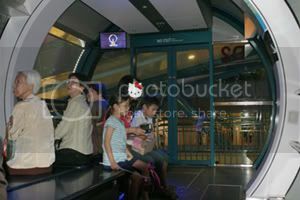 The bus also goes to a few attraction spots nearby like the park, museum, china town, orchid garden, art gallery and others. We can hop off anytime and come back on when we finished with it. 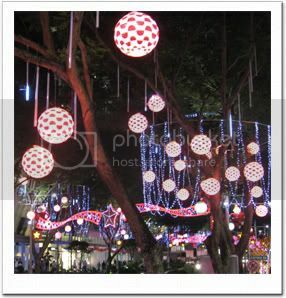 At night, there is a free ride up the Hippo bus for any tourist around Orchard admiring the lights on that street. All you need to do is to take your passport to register at the SVC center at Orchard Road. 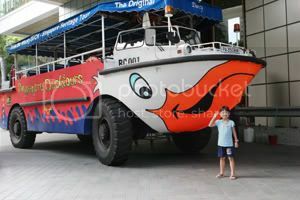 We also went for the ducktour where it is a vehicle shaped like a duck that can travel on land and river. 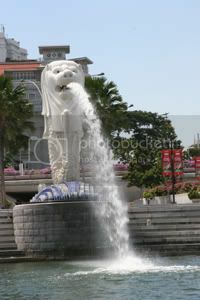 The river cruise was good because it brings to you all the famous spots like the Merlion, Esplanade, Singapore flyer, the tobe Casino etc… Because everything comes in one package, it is quite worth it. By the way, this vacation, I didn’t do much shopping although Singapore has many mega shopping malls. I just got a present for my mom. I mean what can you buy in Singapore that you cannot get cheaper in Malaysia? 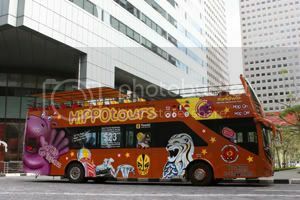 I signed up the HippoTours where they provide open top double decker bus to go round the city and certain heritage places in Singapore. It was a great deal, buy 2 get 2 free. 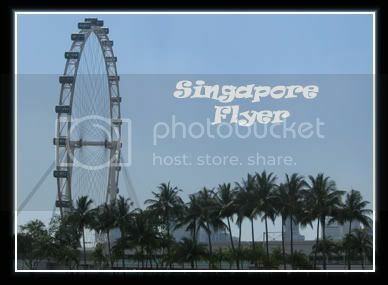 Included in the tour was the Singapore Flyer, ducktour that take us on a river cruise, night river cruise, Sentosa island transfer with return trip, totaling 11 tours for 2 days pass. 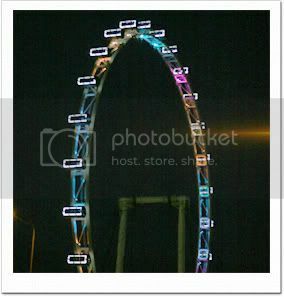 The Singapore Flyer was the highlight. 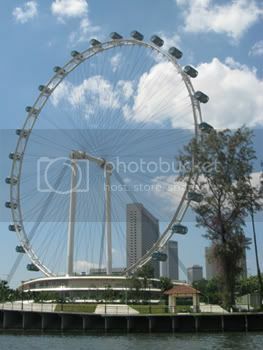 Currently it is the world’s largest giant observation wheel. It brings you up to 165m from the ground. It gives us a breathtaking view. I was a little phobia when I went into the capsule. I sat there enjoying the view from above. After a few minutes, I tried walking towards the window but it gives me goose bum. I did make it. My children, they were making a lot of noise in the capsule, both playing, telling stories and I had to lower their volume. It took about 30 minutes to make the circle. It was worth it and a good experience. 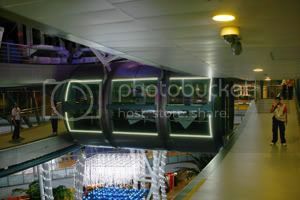 By the way, I heard that you can even dine in the capsule. 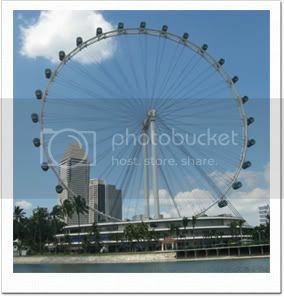 It costs SGD$199 per couple with 2 rotations. My gal loves to eat guava with asam powder, just like me. She was asking me to buy for her. In Singapore, I saw a fruit stall which had guava, so I bought for her. I put quite a bit of asam powder that made me sneeze, maybe pour too much. I told Emily, she can have the guava after she finished her lunch, which she did. She took a bite and gave it back to me. She didn’t like it at all. I tasted it and realized I put pepper instead…lol. :giggles: I was wondering why the fruit stall would put pepper there. Then I saw the next stall was selling half boiled egg. Well, I had to clean the guava with soup and put the right asam powder. Of coz, Emily would rub it in and said “Why did you put pepper, mummy? You want me to sneeze.” Now I know why I sneeze when I put the powder. Silly me!